Where did we get the idea that aging had to mean "growing old?" Can you picture yourself at age 70 or 80, still being active and energetic, enjoying a couple of laps around the pool or 18 holes of golf? To many of us, a balanced diet, daily exercise and valuable nutritional supplementation may not seem that important at age 20, 30 or 40.
you'll have throughout the rest of your life. Like the foundation of a house, this all-in-one womens pack provides the base from which to build a life of better health. Specifically designed with womens health in mind, RiteStart Women is far more than a daily multi-vitamin and mineral supplement. It features a proprietary Womens Health Blend that has been exclusively developed for the female body and its needs. RiteStart–Exclusive Anti-Aging Pack for Women RiteStart Women from 4Life is a combination of nutrients like no other. Named for the exact purpose it provides...a RiteStart for your day, for your health and for your life . . . this product is designed to help you look and feel great, and have the energy and immune support you need to achieve your life-goals. What is in the RiteStart Women? Specific Nutrition for Women: Men's and women’s bodies are different, and thus have different needs. 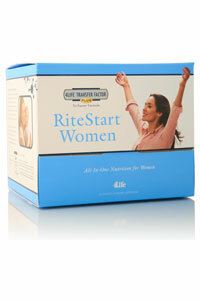 RiteStart Women features nutrients that support wellness in areas where females need it most. Calcium, magnesium and ipriflavones for bone health, soy isoflavones for healthy hormone balance and a perfect balance of vitamins, minerals and antioxidants specific for optimum female health. • 4Life Transfer Factor Plus Advanced Formula: This advanced formula provides far-reaching immune support. It combines the synergistic power of 4Life Transfer Factor Advanced Formula with the proprietary Cordyvant blend to support overall good health. Recent scientific studies report that this Advanced Formula boosts immune system activity 437 percent above normal immune response. • Essential Fatty Acids: Essential Fatty Acids (EFAs) are vital to your body and must be supplied through food or supplementation. EFAs are required to support healthy cellular production and blood pressure levels. They also support healthy joints and flexibility as well as healthy mental development and acuity. • Antioxidant Protection: Each packet provides a great source of antioxidants. RiteStart features multiple antioxidants including vitamins A, C and E, OPC (pycnogenal) sources such as pinebark and grapeseed extracts and other sources such as bilberry, lutein, CoQ10, alpha-lipoic acid and zinc. A well-rounded product like RiteStart provides optimum health support. • Life C: Exclusive to 4Life, this multi-form of vitamin C provides maximum benefits. Are all vitamin C’s equal? No way! Life C contains seven forms of vitamin C that are absorbed into your cells efficiently, providing increased health support. • Hyaluronic Acid: Found abundantly in cartilage and synovial fluid when we are young, Hyaluronic Acid’s main function in the body is to cushion and lubricate the joints. Over time, our bodies produce less and less Hyaluronic Acid. Did you know? Transfer factors are tiny molecules that transfer immunity information from one entity to another, such as between a mother and her infant who she breastfeeds. Transfer factors educate your immune system, thus supporting the recognition phase of an infection. This provides the necessary support for the immune system to be able to remember healthy immune function. Survey’s conducted by the National Institute of Health show that 75% of Americans do not consume the recommended daily intake of the 23 essential vitamins and minerals. Calcium d-Glucarate assists the body in removing toxins, a process called detoxification. • Contains 25 vitamins and minerals, 4Life Transfer Factor Plus, Essential Fatty Acids, full-spectrum Antioxidants, Calcium d-Glucarate, Soy Isoflavones and other essential nutrients. • Lutein is a powerful antioxidant shown to help support eye health. • Coenzyme Q10 plays a crucial role in the generation of cellular energy and healthy circulation. In addition, this powerful antioxidant plays a significant immunological role that supports the cardiovascular system. Like the foundation of a house, this all-in-one men's pack provides the base from which to build a life of better health. Specifically designed with men's health in mind, RiteStart Men is far more than a daily multi-vitamin and mineral supplement. It features a proprietary Men's Health Blend that has been exclusively developed for the male body and its needs. This proprietary blend along with Transfer Factor Plus, essential fatty acids, full-spectrum antioxidant power AND anti-aging nutrients make RiteStart the best, most unique wellness product available. 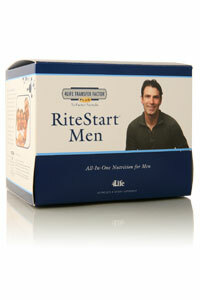 Whether old or young, RiteStart is the answer to men's nutritional needs. What is in the RiteStart Men? 4Life further advanced its vitamin and mineral formula with the addition of Life C – a proprietary blend of seven forms of vitamin C. Vitamin C is a very powerful, water-soluble antioxidant that also acts as an immune system stimulator and effective detoxifier. Contrary to common belief, there are more forms of vitamin C than just one. Ascorbic acid represents the form of vitamin C that is most commonly used today; however nature has provided a variety, each one supplying a different benefit. Multivitamin and Mineral Formula: RDA requirements outlined by the US government provide only the minimum daily allowance of vitamins and minerals necessary to maintain health. While most multivitamin and mineral formulas are virtually unchanged from over a decade ago, the vitamin and mineral formula contained in the Ritestart incorporates all of the latest research in medical science, including the benefit of amino acid chelates for the most effective absorption of selected minerals. Transfer Factor Plus: The cornerstone of 4Life's philosophy is that a healthy body begins with an efficient immune system. There is no better answer available to immune issues than using 4Life Transfer Factor Plus. Not only are you getting Transfer Factor XF, you also maintain heightened immune function with the following ingredients added: Maitake and Shiitake Mushrooms, Cordyceps, IP6, Thymic factors and Zinc – these combine with Transfer Factor XF to improve NK cell activity by as much as 248%. Continue to feel your best with Transfer Factor Plus. Essential Fatty Acids: 4Life's BioEFA™ combination is another exciting feature in the new RiteStart System, formulated with beneficial fish oil, borage seed oil, flaxseed oil, and CLA (conjugated linoleic acid). Essential Fatty Acids are considered "essential" because they are needed for life, yet they cannot be produced in the body, so we must receive them through the foods we eat or supplementation. Essential Fatty Acids include two families that must be obtained through diet called Omega 3's and Omega 6's. They have been extensively studied and have been known to help maintain proper cell membrane structure, which promotes the effective distribution of nutrients throughout the body, and aid with the efficient metabolism of cholesterol. In addition, they also provide DHA (docosahexaenoic acid), which may play a role in maintaining the health of the nervous system. 4Life offers a variety of antioxidant products. RiteStart continues to provide the finest antioxidant known today with a blend containing Oligomeric Proanthocyanidins (OPCs) from pine bark and grape seed, Coenzyme Q10, Alpha-Lipoic Acid, Bilberry, Quercitin. These anitoxidants are of unequaled quality in our industry, however, 4Life is proud to take antioxidant protection one step further by including Lutein in RiteStart. Lutein is a powerful antioxidant that has been shown to lower chances of Age-Related Macular Degeneration (AMD) by 57%. AMD is the leading cause of blindness in adults over 65 and 4Life recognizes that including Lutein may protect our customers and their families for years to come. Calcium d-Glucarate. Calcium d-Glucarate: There are many toxins in the world today, and even with healthy diet and exercise these toxins eventually might cause illness. 4Life recognizes the need to detoxify regularly and naturally so RiteStart contains Calcium d-Glucarate. Calcium d-Glucarate is the patented form of glucaric acid which is used by the body for detoxification. While glucaric acid is found primarily in fruits and vegetables such as apples, grapefruit, broccoli and cherries, research inidicates that increased levels of Calcium d-Glucarate achieved through supplementation are effective in assisting the body in detoxification. The health benefits of Calcium d-Glucarate have been examined by world renowned research institutions such as the AMC Cancer Research Center and the M.D. Anderson Cancer Center. There are also over 30 studies published regarding Calcium d-glucarate in cancer research journals. In addition to the unique nutrients already mentioned, RiteStart Men blends lycopene – well known to support and maintain prostate health, and soy isoflavones to promote healthy hormone balance. High levels of lycopene, the most abundant cartenoid in the prostate, are linked to prostate health. Specifc Nutrition for Men: Men and women's bodies are different, and thus have different needs and requirements. RiteStart Men features nutrients that promote a healthy prostate, along with the perfect balance of vitamins, minerals and antioxidants specific optimum male health. RiteStart Men – The complete nutritional program formulated just for men. Transfer Factor Plus: This proprietary blend of immune activating ingredients features Transfer Factor XF and other proven immune system nutrient such as IP-6, beta-glucans, maitake and shiitake mushrooms. An independent study on Transfer Factor Plus showed an increase in NK Cell activity by 248%. Transfer Factor Plus has the power to keep you healthy and feeling great. Essential Fatty Acids: Essential Fatty Acids (EFA) are vital to your body and must be supplied through food or supplementation. EFA's are required to rebuild and produce new cells and support healthy blood pressure levels. They also promote healthy joints and flexibility, and support mental development and acuity. Lutein: Lutein is a powerful antioxidant shown to help support eye health against macular degeneration. Life C: Exclusive to 4Life, this superior multi-form of vitamin C provides the maximum benefits for a vitamin C product. Life C contains seven forms of vitamin C that are absorbed into your cells at a higher rate, providing increased protection and support. Hyaluronic Acid: Found abundantly in cartilage and synovial fluid when we are young, its main function in the body is to cushion and lubricate the joints. Over time our bodies produce less and less Hyaluronic Acid. A lack of Hyaluronic Acid in the body has been directly linked to connective tissue and joint degeneration.